Adobe AEM provide its extendable capabilities to integrate with other products. Below demonstration describe how to connect Adobe CQ5 with Salesforce which is the market’s leading cloud based CRM System. CQ5 provide OOTB components for the integration purpose. It helps the organization to target the customers through web channels as per their status in CRM. 1) CQ5 uses OAuth mechanism to connect to Salesforce. 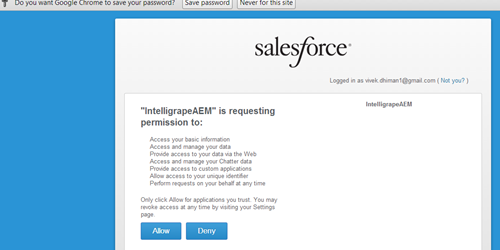 So , we first need to create an app inside salesforce to get customer secret and access token. Login to salesforce. Go to Setup ->Apps section and create new app. Fill in required details as shown in below images. Callback Url here accept only https urls, so our CQ5 must be SSL configured. Callback url is the url of cloud service that we will create in CQ5. 2) On save, it provides you customer key/customer secret which we can use at CQ5 side to connect with salesforce. 3) Create the salesforce cloud service, Dialog will appear which will ask to enter the key/secret. Fill in value you got from step 2 & click Connect to Salesforce. 4) CQ5 sends REST call to salesforce & if salesforce authorizes it, you will be able to view below image. Click allow. 5) We can test the connection by transfer the data from CQ5 to Sales force. Here we will export the CQ5 users as salesforce leads. We can check the user properties in CQ5 by going through profile node of user. 6) CQ5 provide the OOTB Workflow for this activity. We just need to add the salesforce configuration that we added in previous steps. 7) Start the workflow, Select the profile node as payload as it contains the properties which will be map as lead’s properties in salesforce. 1) CQ5 Instance must be SSL enabled. 2) Salesforcetake 5-10 min to enable the app after creation, so connect CQ with Salesfore after that. 3) Callback URL should be fully qualified path of your configuration page with extension. 4) Before starting the workflow, make sure you have tagged your salesforce configuration inside it. I am getting below error when I start the workflow , did you also face something like this ? Hi Vivek, is the same possible also for other Standard SFDC Objects or even Custom ones?